Pot bellied Pigs. Should I Get One? Pot Bellied Pigs have become an enormously popular pet to have, and rightfully so. They are intelligent, charismatic, playful, loving, loyal and clean. But with such a fantastic pet needs to come a responsible sense of ownership. Many pot bellies end up on adoption ranches, or worse, abandoned and forsaken because the owner got them on an emotional whim without researching much about them or considering that having a pet, any pet, is a full time responsibility that takes love, patience and dedication. As cute as they are, they are not so cute when they are underfed, often at the recommendation of unscrupulous breeders (to keep them small), neglected (they can become destructive if they are not kept stimulated) or abused in any other way. Daniela has a special love for pigs, and I have one for all animals. We always had them around when I was young. We had the usual pets like cats and dogs and hamsters, turtles and fish, but my father also kept chickens, rabbits and a horse. My grandfather had a cow, ducks, chickens, and goats which he raised in a free range environment long before it was popular. It was through this environment that I was able to develop the love and appreciation of animals I have for them today. Our present accomodation sadly prevents us from having any pets, however we have decided when we move to the country, which will be in the near future, first on the list is a Pot Bellied pig! We'll announce it and post pics, so stay in touch! We have had ample time to research and think about this decision and encourage anyone considering getting a Pot Belly to do the same. We've come across alot of valuable, interesting and important information, and hope that our sharing it will assist you in your desire and decision to become an owner of a Pot Bellied pig. A thorough knowledge of everything involved will help you to provide the perfect home for what can truly be the perfect pet! Why Do I Want a Pig As a Pet? When we see a cute little pig such as "Babe" of movie fame or even Suzanne Sugarbaker's slightly larger attendant "Noelle", we can't help but be moved to think, "Hey I'd like to have one of those". It's normal, natural and shows that we have an appreciation for special things. However, before we ride that emotional, nostalgic feeling all the way to the nearest breeder or pet shop, its best to put the brakes on and ask ourselves why we want a pig for a pet in the first place. 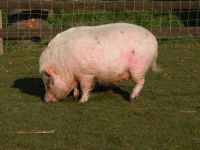 Of course there can be many reasons, a longing for companionship, a genuine love of pigs or animals in general, but it's best to be sure that it's not just a whim and wait a couple of weeks before we really start to seriously consider getting one. Shelters are overflowing with Pot Bellied pigs brought home by well meaning people who thought they really wanted a pig, but had no idea of what a pig really is, and what's involved in caring for one. If the desire survives a two week waiting period and you haven't gone off looking to strike your next fancy as we often do, then perhaps the desire is genuine and the reasons sincere. Now it's time to find out what is actually involved in owning Pot Bellied Pigs. 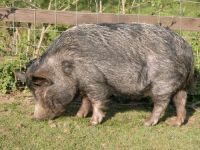 What's Involved in Owning a Pot Bellied Pig? Where do I begin? Just kidding! Although there is alot of information particular to caring for the needs of Pot Bellied pigs, some basic common sense rules about pet care can be applied to make life happier and healthier for you and your pig. Firstly, be aware that Pot Bellied pigs are intelligent, charming creatures, and can be quite manipulative. You will have the advantage if you first discipline yourself and resolve to be determined not to be swayed by their pretty piggie eyes and loving grunts! They are masters of seduction! In some ways, Pot Bellied pigs are similar to dogs, however, this is a general summation, the pig is entirely different in other ways. One similarity though is that they have a "pack mentality" and will seek to dominate the home if allowed. It must be established in a gentle, yet firm way, who is the boss from the very beginning. The best way to do this is to patiently correct behaviour that steps outside the boundaries. Pigs learn to understand what "No" means rather quickly because of their intelligence, and also respond well to a reward system which includes praise and treats. Use "no" firmly, they respond more to the tone than the word. By no means should you become physically abusive towards your pig, if you find this necessary you're not cut out to be a pet owner period, and they won't forget it. Pot Bellied pigs can also be trained to walk with a leash and even house trained. Patiently correcting and redirecting your pig when he or she gets off track will reward you with a well behaved and emotionally healthy friend. What Am I going To Feed It, And How Much Will It Cost? The expression "eats like a pig" did not just come about by whim. There is much truth to that saying! However, it is much more affordable to feed a pig than you might think. On average, and depending on the cost of living in your area Pot Bellied pigs can be fed for $30-$50 per month. Pot bellied pigs do love to eat though, and they'll eat all the time if you let them. Even when you don't let them they will forage for food, as it's instinctive for them. They are capable of learning to open cupboards and refrigerator doors, and will knock over garbage cans to in their quest for sustinence. Establishing a regular feeding routine of a proper diet and only the occassional treat will keep their foraging and begging, yes they beg like dogs, to a minimum. Never feed them from your plate, you'll never have another meal in peace. Pot Bellied pigs also need to be protected from becoming obese, as this will further complicate things and cause them health problems. Foraging can also be kept to a minimum if a space with soft ground where they can dig is provided. There are several types of pre-formulated foods available especially for Pot Bellied pigs, usually they are a 14 to 16% protein blend of grain and hay, and one of these should form the major part of their diet. If they are not available where you live, these foods can be ordered. Mazuri, is a subsidiary of Purina Foods from whom you can order online, or you can order them through your local Purina dealership. Ross Mill Farm is another online source from America. In Ireland you can find them at Baumanns Pet Shop. If we can assist you in locating a source of pet pig food in your area, please use our contact form at the bottom of this page to send us a request and we'll do our best to track some down for you. You must fill in the address fields for best results. Your local veterinarian should also be able to assist you. Never use swine formulations designed to increase hogs in weight for slaughter. Those formulas all contain additives to increase hunger and will change your pet's attitude into a voracious creature and reduce it's lifespan from chemical intolerance and obesity. Piglets, much like our own babies, should be allowed to eat when they are hungry, up to 2 cups a day from when they are 3 weeks old up until a year. One cup of pellets in the morning and a salad of fruits and vegetables in the evening should suffice an 80lb Pot Bellied pig, or use the rule of twice a day at 1 to 2 % of the pigs body weight. Fruits should be kept to a minimum though as they are high in fructose and thus calories, while potatos, corn, spinach and tomatos should also be regulated. Always make sure your pig has an ample supply of water. Shredded wheat and unsalted, unbuttered popcorn are healthy treats for pigs, and pre formulated piggie snacks can also be bought or ordered. Sweets such as chocolate and candy, potato chips, basically junk food should be avoided, or your miniature pot bellied pig won't be so miniature! While I'm on the subject, allow me to emphasize that the term miniature is relative. Genuine Pot Bellied pigs still grow up to 120lbs, an obese one can be 150lbs. So called "miniature" pigs are actually just Pot Bellies whose growth has been stunted by unscrupulous and cruel breeders who underfeed them and will encourage you to do the same. Please do not support this inhumane practice. Inside or Outside The House? The natural habitat for Pot Bellied pigs of course is outdoors, however, they are quite capable to adjusting to life inside the home. Though keeping a pig outdoors all the time will do him no harm, you will definitely miss out on the opportunity to interact with quite a character. Many Pot bellied pigs are kept between the two, some outside during the day and inside in the night when they spend quality time with their families, some are kept inside most of the time and given outside play and potty time. Whatever you decide, a balance that suits both you and your pet needs to be struck. A pig kept inside all the time without the ability to indulge his natural tendencies to forage and graze may become quite unhappy, neurotic and difficult to control. Wherever you decide to keep your Potbelly, it will need its own space, preferably somewhere warm and free of drafts. Many owners keep them in the kitchen or utility rooms, others in the family room or den where they can be with their human companions. Getting your pig in the habit of sleeping in your bed when it's young will cause problems as it gets older and becomes territorial. Sleeping bags or quilts make great beds for pigs, throw in a few blankets and take delight in watching him make his bed everynight! Pigs are early to bed, early to rise animals, and usually lay themselves down to sleep when darkness falls. Pigs need to potty, and though they can be housetrained, it doesn't hurt to keep a litterbox inside just in case. A shallow tray with sides no more than 2" high and around 2ft X 3ft will suffice, and several different kinds of pans of these dimensions can be found in hardware stores or construction supply companies. The tray should be lined with either newspaper or woodchips, as for some reason they find kittie litter delicious and will eat it.Train your pig to urinate in the litter tray by placing their water bowl in there as they like to urinate while drinking. Placing faeces inside the litterbox will train him to defecate there. Once the scent is established they will return there regularly. Outside potty training can be accomplished by placing your pig in a designated enclosed area within your yard. Again, once the scent is established he'll return to the same spot regularly. If you decide to keep your pig outside at night, make sure he has a large dog box type house or wooden barn to sleep in. Line wherever he lays with plenty of straw or blankets and ensure he can fit in there comfortably. If your pig is going to spend alot of time outside in your yard you want to be sure he has his own pen, or fenced in area so he doesn't destroy and precious plants or flowers you may have. Pigs will wonder away or stick their noses in places they shouldn't if left to roam wild, not to mention the digging and foraging they will do. Whether inside or out, make sure your pig or pigs cannot access any cupboards, closets or storage rooms where chemicals that could be harmful to them are kept. Still want a Pot Bellied pig for a pet? Then I believe you will genuinely make a good owner! Go to our next page by clicking on the link below our submission form where you'll find information on Pot Bellied pigs and how they get along with other household pets.